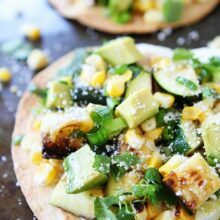 Zucchini, Corn, and Avocado Salsa-you will fall in love with this fresh and delicious summer salsa! It is great with tortilla chips or served along side grilled chicken, fish, or your favorite Mexican meal. Every Sunday we eat chips and salsa for lunch. It is our little family tradition. I know it may not be the healthiest lunch on the planet, but I don’t care. Family traditions are more important sometimes:) I like to mix up our salsa routine so we don’t get bored. Some of our favorites include: Restaurant Style Salsa, Strawberry Mango Salsa, Pineapple Salsa, Black Bean Corn Salsa, and Peach Salsa. 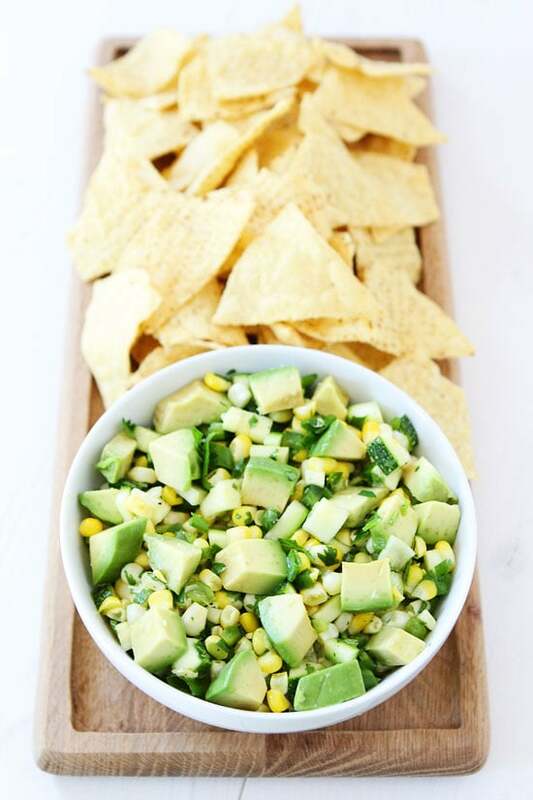 Last week I made Zucchini, Corn, and Avocado Salsa for our Sunday chips and salsa lunch and it was EPIC! It is my new favorite salsa! And since it has zucchini, corn, and avocado I am considering it a healthy lunch choice. Hey, I am getting my veggies and fruits. It is all about balance! When I told Josh I wanted to make zucchini salsa for lunch he wasn’t excited. He turned up his nose and said he would make one of our standard salsas for himself. I told him to hold the phone and trust me. He agreed to give it a try. I got to work and created the most beautiful green and yellow salsa a gal or guy could ask for! I was in love before I even took one bite! 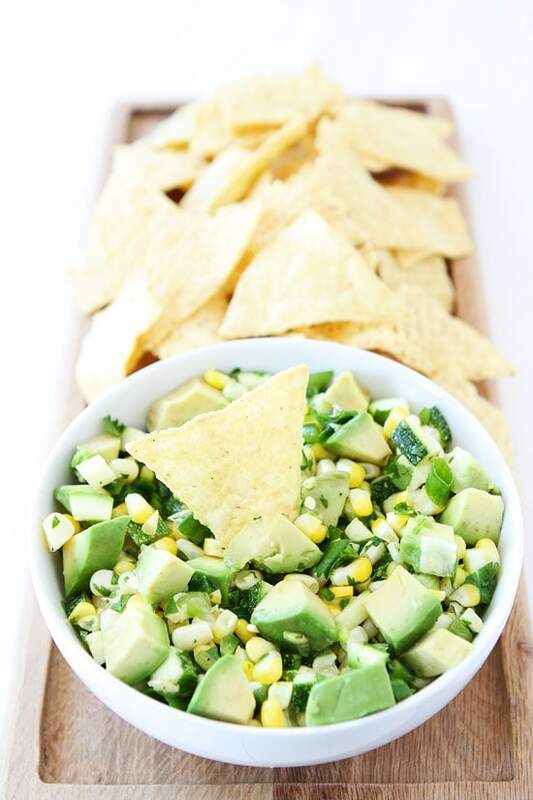 If you are looking for a fresh, simple, and healthy summer salsa, make my Zucchini, Corn, and Avocado Salsa. It is a great recipe for using up your summer produce. I know you are looking for zucchini recipes right now! 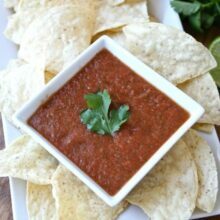 We ate the salsa with chips because that is what we do on Sundays, but it would also be great along side grilled chicken, fish, or your favorite Mexican meal! Enjoy! This simple and fresh salsa screams summer! It is great with tortilla chips or served along side grilled chicken, fish, or your favorite Mexican meal. Carefully slice the kernels off the ear of corn. 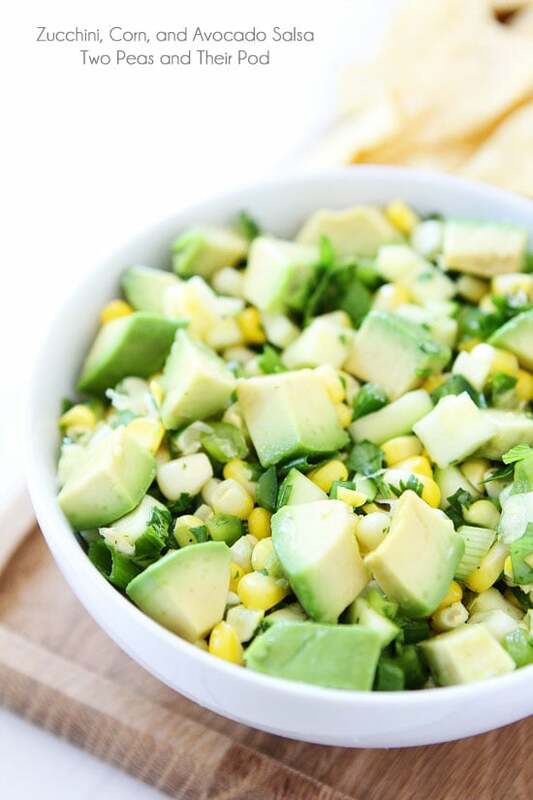 In a large bowl, combine corn, zucchini, jalapeno, cilantro, green onion, avocado, and lime juice. Season with salt and pepper, to taste and stir. Serve with tortilla chips. Note-this salsa is also great served with grilled chicken, fish, or your favorite Mexican meal. This looks awesome and I want seconds, already! 🙂 Pinned! 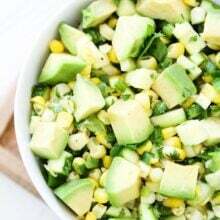 I made a zucchini and corn salad/salsa earlier this week and it’s one of my fave things I’ve made in awhile! This sounds great! I have one question, though. Do you cook the corn first??? Thanks. I love your Sunday lunch tradition! I should start that. You’ve inspired me. And, this salsa! YES! I actually mix zucchini and avocado all the time…so with corn? Face plant city. Pinned! I love salsa and this is a new spin for me! I’m always looking for ways to incorporate all our extra zucchini from the garden. Yummm!! I love having new salsa recipes to try and all the flavors of this one look great! I like this salsa already! 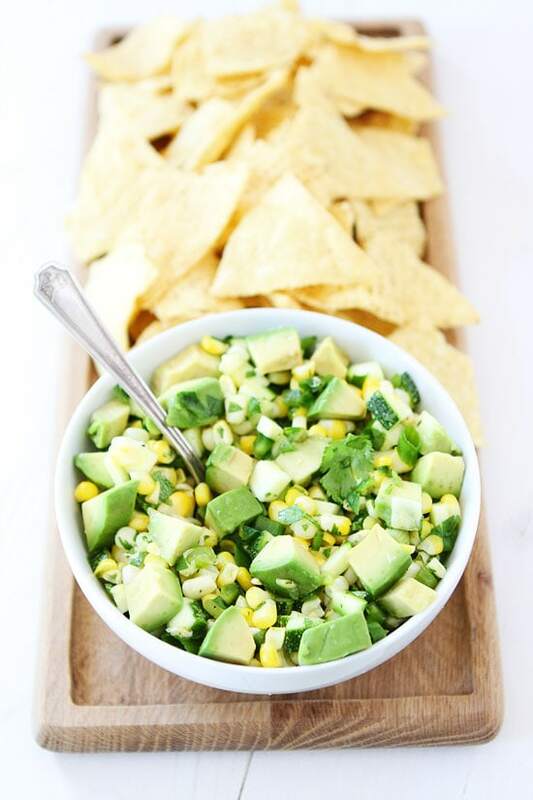 Corn and avocado: yum! This looks outstanding! This is such a perfect summer salsa. Beautiful summer salsa! 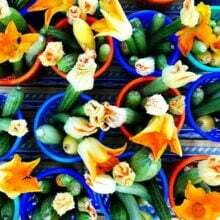 Love zucchini!! Such a healthy idea ! I would even eat it as a salad! I love your tradition! that feels like something we could get on board with! This variety looks delicious. Now I need to make tacos and pile this on sky-high! Perfect for my nacho bar! Can’t wait to try this! Looks fantastic! Perfect for summer! Never had raw zucchini before. Will definitely try. Thanks! What a fun Sunday lunch idea. I like special events like that, which are small but enhance life. Thank you for sharing. I will agree that this is epic for a salsa. But I am so partial to the ingredients, I might be a wee big prejudiced. 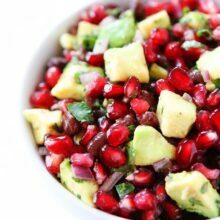 This is definitely my kind of salad: simple, healthy, and easy. Thanks so much for the recipe. Pinning it now! love the idea of zucchini in salsa! and it’s so pretty! I made this for two different parties this weekend and recieved RAVE reviews!! So simple and yet so delicious. Thanks for sharing. This sounds wonderful!! I was also wondering if you cook the corn first? 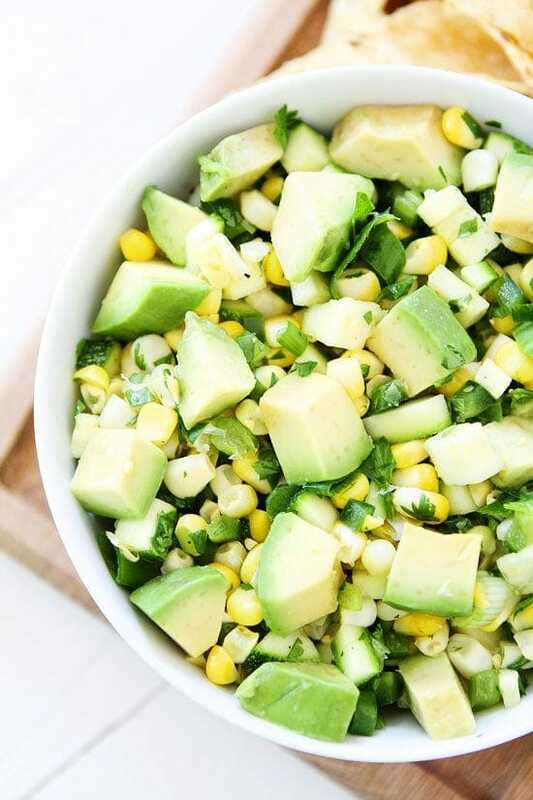 I’ve made a salad very similar to this, without the jalapenos, with tomatoes, grilled corn and avocado. Dressing is a lime juice/honey/canola oil mix. This article inspired me to throw some zucchini in there next time! I have made your recipe twice to take to separate events and everybody raved!! This combination of ingredients is salsa magic. I’m glad I doubled the recipe!! So delicious. Would love to see nutritional info as well. The best!! Bar none! Took it to a dinner and there was nothing left! I am going to make this. I am learning how to cook vegan. This year I am starting a catering business and the audience I want to capture are the vegans and vegetarians as well as the “mainstream”.